You have come to the right "Face"! Caricatures should be fun. We strive to make them fun for those around and those being drawn. Ultimately we hope our caricatures are proudly displayed in your home or office. In 27 years we believe that we have found the balance between a fun caricature and one that has a "bite" to it. Caricatures should ultimately be a "caricaturization" of the subject that clearly reflects and reveals both their outward appearance as well as a touch of their personality. Our caricatures are never meant to be mean or just gross exaggeration. 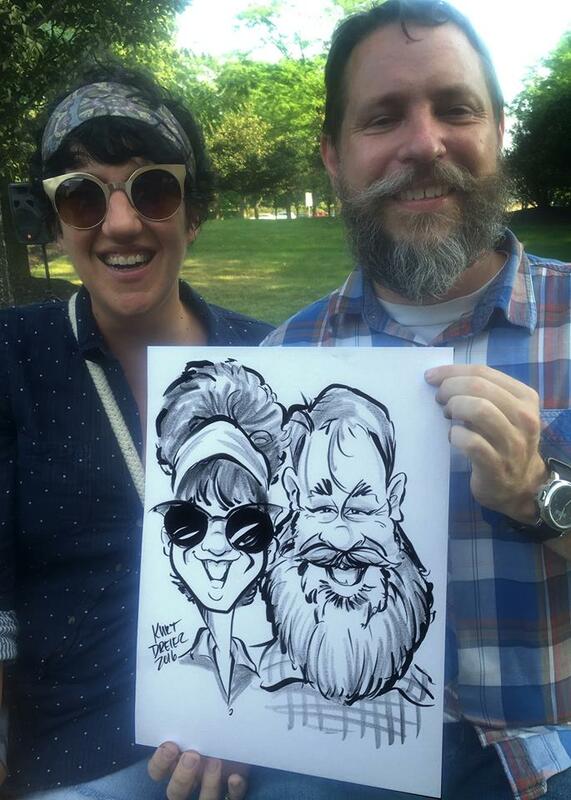 When you look at our caricatures we hope you see "you"! One Saturday afternoon at the Art Institute of Pittsburgh in 1984 Kurt attended a morning workshop on drawing caricatures. The instructor was world famous caricature artist John Johns. The aim of the workshop was to train and recruit artists for the upcoming Pittsburgh Arts Festival. Kurt never drew at the festival but his roommate did. Kurt didn't draw caricatures for the next 5 years while pursing a teaching degree. However once in the classroom Kurt and with the inspiration of his roommate's experiences in the back of his head started drawing his art students. From there a parent of one of his students invited him to draw at a large craft show, the Praire Peddler in Butler, Ohio. The love of live caricatures soon became a passion and Kurt began his professional caricature career. Now 27 years later Kurt is still drawing and loving every minute. Although his day job is still teaching computer graphics at a public high school and serving as an adjunct professor at both Zane State College and Ohio University Kurt loves to get behind the easel and talk with people while hopefully brightening their day is some small way. Now you will find Kurt drawing with his daughter Lauren who he has had the pleasure and privilege of teaching and entertaining with for the past three years. Check out the bios of our artists. Need more artists? No problem. We have a number of additional artist available that handle large events. Call us for discounted pricing for additional artists. Kurt has loved making people laugh for over...well...for a long time! The past 27 years Kurt has been doing it by drawing caricatures for all sorts of individuals and events. Kurt knows how to entertain the young, old, grouchy, and crazy. Kurt has learned the fine line between fun and embarrassment by entertaining students as public school teacher and university professor teaching both traditional and digital visual arts. Kurt is a homeschooling father of over 18 years which counts as his greatest teaching accomplishment. Kurt owns Dreier Design Group LLC which specializes in print layout, instructional illustration, and motion graphics. Lauren has taken her love of art and has turned to the art of caricature. Studying under her dad Kurt and world renowned caricature artist and illustrator Jason Seiler, Lauren has now drawn caricatures for over 3 years professionally. Great with the kids as well as adults, Lauren is sure to "draw smiles"! Please contact us with specifics about your event. We can provide you with a quote and details on how we can make your event memorable!